Balloon and Inflatable Fetish Forum » Discussions » Inflatable and PVC Fetish » Anything new with beach balls lately? Re: Anything new with beach balls lately? I got one of these, though I'm not quite sure what the inserted sleeve in the middle is supposed to do, it is very satisfying. As far as I know, you're supposed to put a hose through the center so it sprays water everywhere, or something like that. 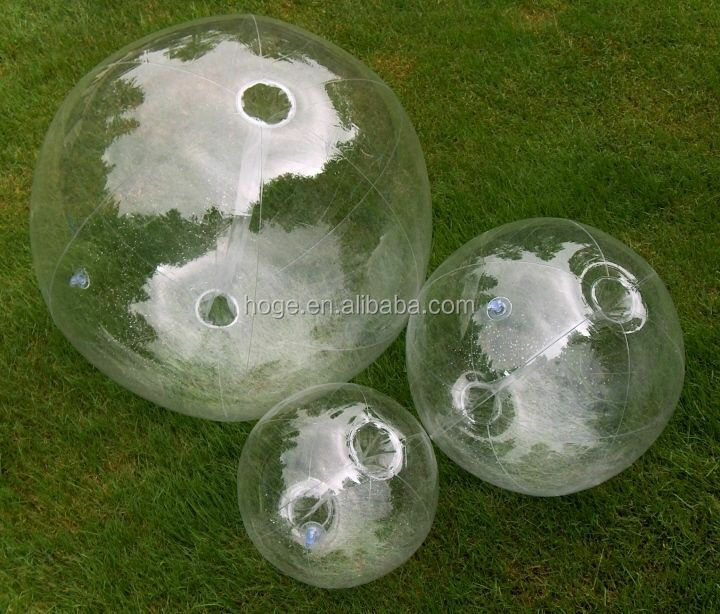 Do they make these transparent balls in 42 inch? For me this size is right on; 36 inch is good which is most of my balls, but 42 is just perfect, 48 is just a tad too big. .
Just got my first 24 inch beachball. Made by intex, haven't had the chance to use it yet. Material seems nice. Shiny plastic but unfortunately doesn't have that classic inflatable smell that we all love. Doesn't smell of anything. It looks thin but strong, bet it can be overinflated. Anyone else tried these? I love them! I have a 24 inch intex beachball in alternating white with pink blue and yellow panels. It had a smell but for me a smell doesnt do much. I have overinflated it many times and its stretchy! So far no leaks or pops! The leaks eventually will happen if your rough with it. I actually took it in the shower a few days ago when I had my place to myself. First time. What a feeling! That's the one I've got. Good to know it'll survive overinflation. I always blow them a bit too big. Valve looked a bit small so it might take a while to inflate. Might have to remove the flap so I can blow it faster. Only problem is that they sometimes leak after. I'll probably attempt to fix any leaks with epoxy. Anyone tried that? It's usally quite strong. Takes longer to dry than super glue but is a lot stronger. Epoxy probably won't help much, vinyl glue would be better and is pretty common. Here's a video about repairing inflatables with it. I had time to inflate it today. Thought it looked a little small to be 24 inch. I measured it and was disappointed to find it was only 17 inches (obviously meant to be 16 but I blew it a little too big) dunno if they sent the wrong one or if it's a typo on the website. Got it off Amazon for £3. Still a nice size but was hoping for something larger. Oh well. I guess I'll see how close to 24" I can get it. Last edited by John225; 24-07-2018 at 09:01 PM.